Today I am thrilled to have a guest post from my Gamma Phi Beta sorority sister, and super-mom Lexa. I have known Lexa since 1996, and thanks to the power of Facebook, I have been able to share in her adventures with her seriously expanding family! The best part, there is always a healthy dose of humor and super-cute kid pictures that come along with her adventures! Take it away Lex…. Hi there! I’m Lexa, and I cook A LOT. No, seriously, a whole lot. Why? Because I have a huge family! Let me tell you, five kids (yes, five!) eat a tremendous amount of food and are constantly begging for snacks and treats. Normally I am not the type to hand out cookies and cupcakes. Oh, no, those bad boys have to be earned around here! Of course, that just makes them taste better, right? Half of them are salted with course Kosher salt, the others are awaiting butter & a sprinkling of cinnamon sugar. Yum, right?! Totally! So I decided to make some with 2 of my kids, Sawyer & Ellie. 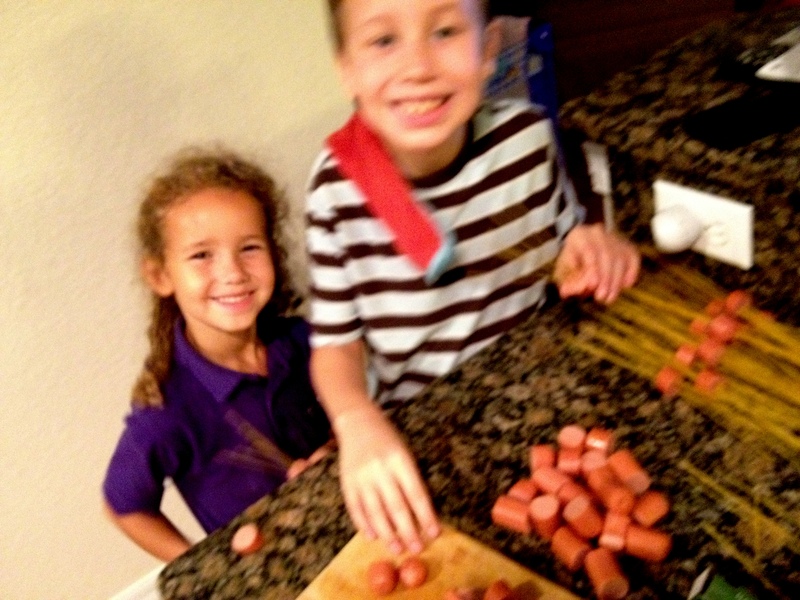 It’s always both fun & frustrating to cook with kids. It takes 2-3 times longer, but they are so excited by the whole process, it’s hard to get too mad, even when they drop a cup of flour on the floor. Ok, so first we gathered the ingredients, learning what each one does. They were really weirded out by the yeast. Preheat the oven to 425 & grease 2 baking sheets. 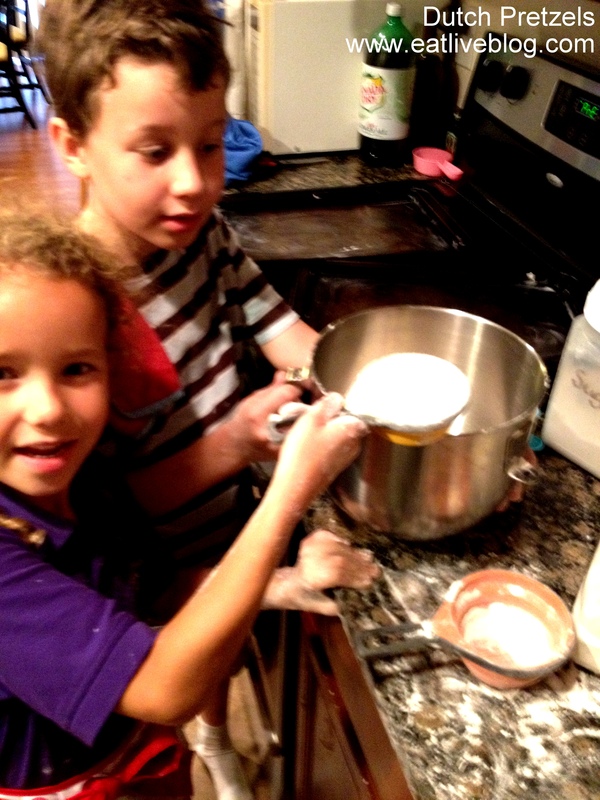 Mix the flour, yeast, sugar & salt in a large bowl, stir in the water, mixing till dough holds together. This is kind of messy with kids, but they love it. 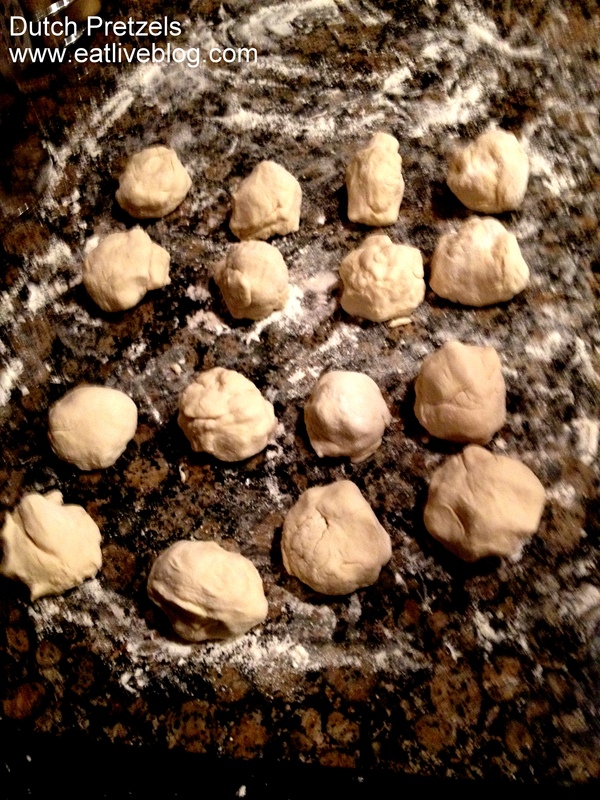 Turn the dough out onto a lightly floured surface, then divide into 16 equal portions. Roll each into a 12-20 inch rope and form into pretzel shapes. Cover them for about 10 minutes, then lightly brush with beaten egg. If you’re going to salt them with the course salt, this is the time. Sprinkle it on right now! This is really important to do in order, because if you forget about letting them rise, and move on to the egg wash and then try to put them in the oven because while you’re making pretzels, you’re also going through multiplication tables for the numbers 3, 4, & 5, you’ll be really annoyed at yourself when you pull them back out of the oven after 30 seconds so they can rise. Also, the towels will stick, and when you forget to reapply the egg wash they won’t turn out a lovely golden brown. They’ll still taste great, though. Just so you know. Bake until golden brown, around 12-15 minutes. While waiting, maybe you can make some hotdogtapus for dinner. If you’re so inclined, I mean. Cool on a wire rack. Now you can add whatever toppings float your boat. We really love dipping them in butter & giving them a heavy coating of cinnamon sugar. I decided to make some chocolate brownie frosting & coat them with it. Head’s up-it looks like fake poo, but it tastes awesome! 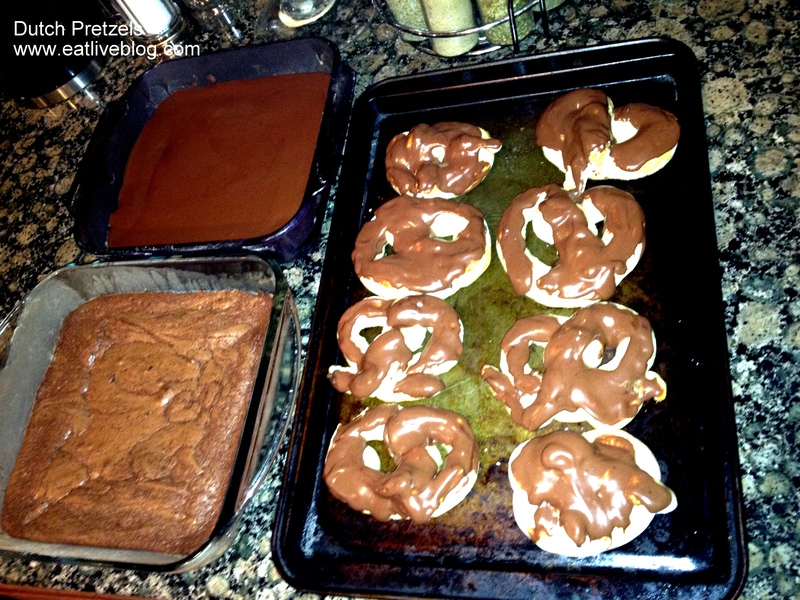 If you’re feeling really extra special, whip up some brownies to go with your pretzels. Send them with the kids in their lunch boxes and await angry notes from teachers dealing with sugar rushes. Easy peasy! And, that, my friends, is how to make Donnelly Dutch Pretzels! 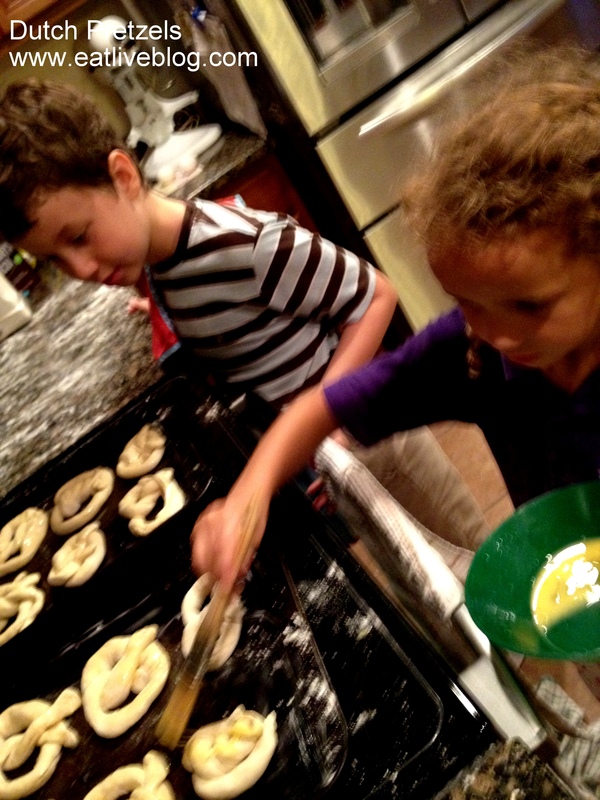 This entry was posted in Recipes and tagged cooking with kids, dutch pretzels, recipe, snack by reneeh. Bookmark the permalink. Fun Fall recipe. It will pair perfect with an Octoberfest brew.